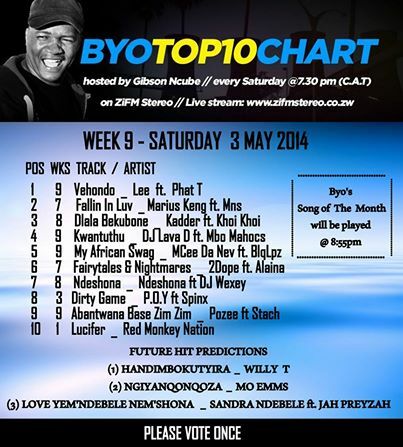 Things have suddenly turned a new leaf in the Zifm Byo Top 10 chart show as Sandra Ndebele and Jay Preyzah song Love Yem’Ndebele Nem’shona made it to top the chart on its first day of entry . The song which was on the future hit predictions shot up to lead the pack. The past days had seen some renowed artiste blasting the chat saying it is meant for those who are still breaking ice in the music scene. The coming of the song in the chat will really add value and make the chart interesting. Week 9 of the chart show saw two songs hit the exit bar Mcee Da Nev-African swagg and Ndeshona by Ndeshona and Dj Wexey. To vote for your favourite track ZiFM whatsapp line 0772168045 or on the chart facebook page BYO’s Top 10 Chart on Zifm Stereo.